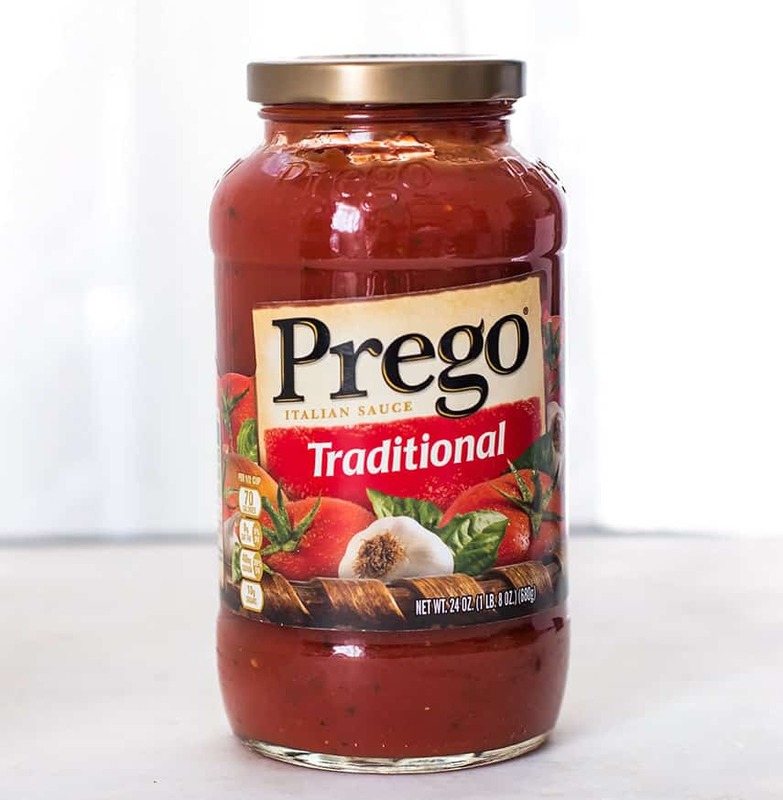 Thank you Prego® for sponsoring this post. All opinions are my own. Time is flying by and it is already a new year! I hope you had a great 2015. We did a lot of fun things and capped off the year with the best holiday season we’ve had in a many years. Per usual, we had (and are still having) way too much chocolate and candies. Figuring out how to regulate the candy allowance is always interesting with the kids this time of year! The winter season is the best time of the year for me as I love the colder weather. It hasn’t changed yet in Southern California, and people are still visiting the beach. I think I’m the only one here that wants it to get cold! As 2016 arrived faster than expected, I still have most of my items still yet to be accomplished on my list of 2015 goals. There just aren’t enough hours in the day (wow that extra hour for daylight savings sure felt good though, didn’t it?). With my two kids and being a working mom, things aren’t always easy. Planning a meal for the whole family is probably one of the hardest things to decide. Easy recipes with simple ingredients are my go-to, and I usually avoid recipes that require more than an hour of preparation (with the exception of those that use a crock pot). 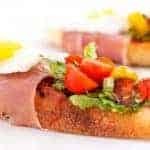 In the spirit of the new year I will try to surprise my family with a special gourmet recipe, and today I am going to show you how to make this Bruschetta with Prosciutto, Tomato Basil and Quail Eggs. This recipe would be perfect for any occasion: serve it for breakfast, dinner or brunch. Trust me, it’s so simple as the only cooking required are the eggs. You can purchase Quail eggs at any international/asian markets and don’t forget to check out your local farmers market. 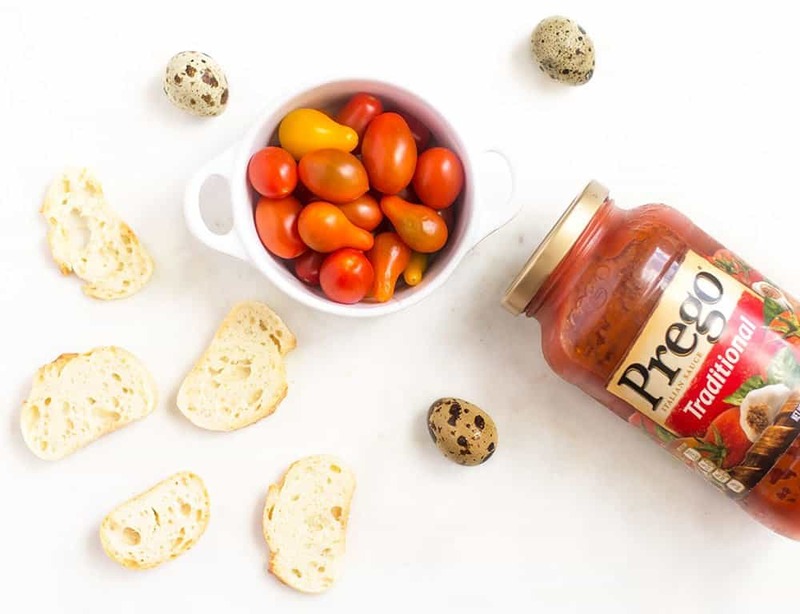 To make this recipe simple and quick, I use the traditional sauce from Prego since it has a vine-ripened tomatoes and nice seasoning. It also works perfectly with the French bread and prosciutto, as one might expect. 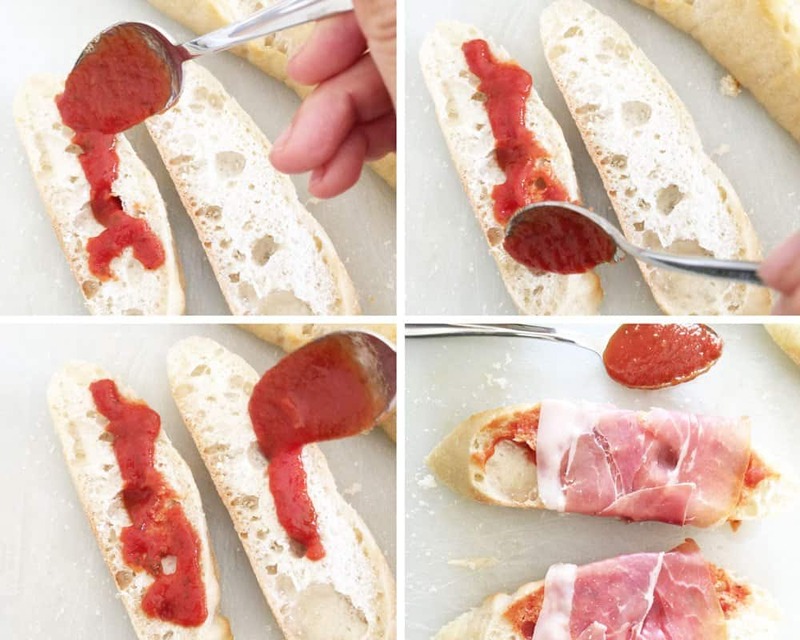 Slice the French bread into bruschetta-like shapes. Mix garlic, olive oil, Prego Italian sauce, basil and vinegar together in a bowl. Heat a pan then spray with oil, and then cook the quail eggs as preferred. Put marinara sauce on the bread. 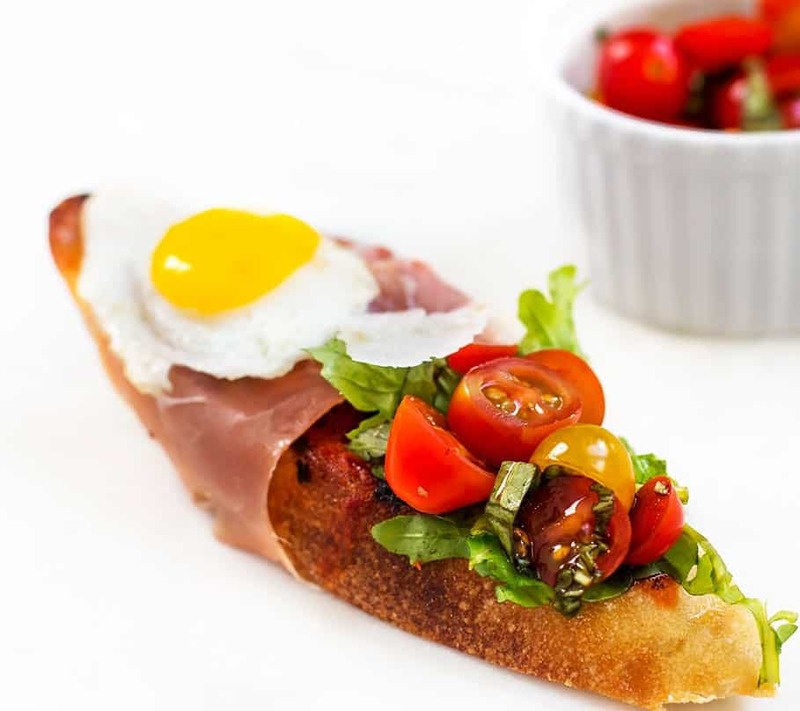 Wrap the bread with prosciutto then add arugula and contents from the bowl (tomato, basil, etc.). Place the quail egg on top and enjoy! I can’t say that I have ever had a quail egg before, but I would try it! This recipe sounds amazing. This is like gourmet! I am a terrible cook, but I kind of want to try this not only because it looks so good, but it is so pretty lol! My husband would be shocked if I made this. This looks beautiful and would be perfect for brunch. It looks like it takes a long time to make so your guests will think you slaved over it! Wow these are so pretty and they sound delicious too. I’d love to make some for a special brunch. This look beautiful. Don’t cook much but love to eat. The type of food you would find in a posh hotel thanks for sharing. Oh my goodness, I’m so hungry right now, I wanna grab this from my screen. It looks so tempting and mouth watering. 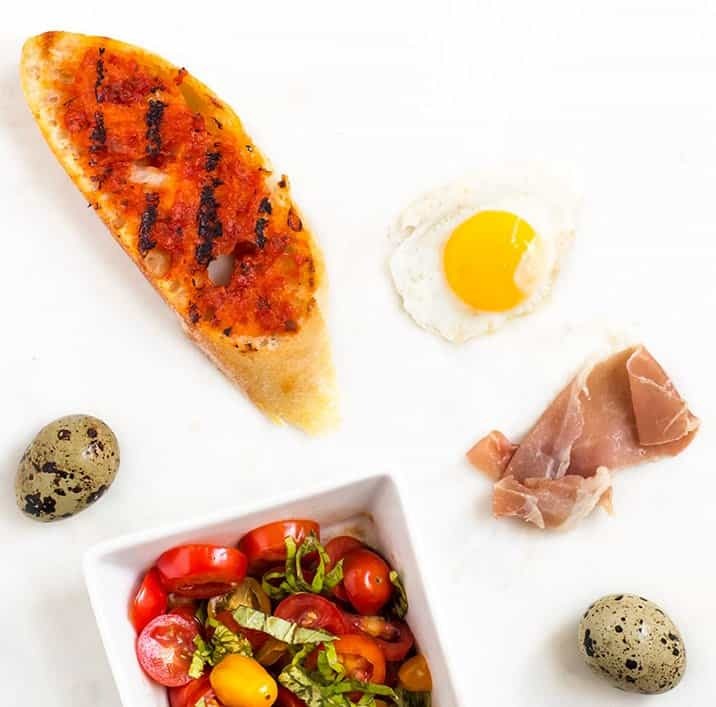 You had me at quail eggs! It sounds delicious all of it. What a neat combination of GREAT ingredients! Thanks! where do you buy quail eggs? I never see them at the stores in my area. from Asian/International market or Local Farmer market, about $2 per dozen. YUM! e used to raise quails and my daughters LOVED eating the eggs we collected every day! That was quick and easy for the prep! I love prosciutto, it’s so tasty and it definitely fits in perfectly with the other ingredients here. I have always wondered what quail eggs taste like as I have never tried them before. I would have it without the ham but it sounds great otherwise. They look beautiful and delicious. This will be great to serve at parties as well. I am a huge fan of brushchetta and rarely make it. I need to change there, there is not a good reason to not make it. Your recipe looks beautiful, whoa those pictures! Can’t wait to make this! YUM! I love the look of at that appetizer. Very gourmet looking. I know what you mean about having too much candy around the house and the temptations. We have way too much as well. 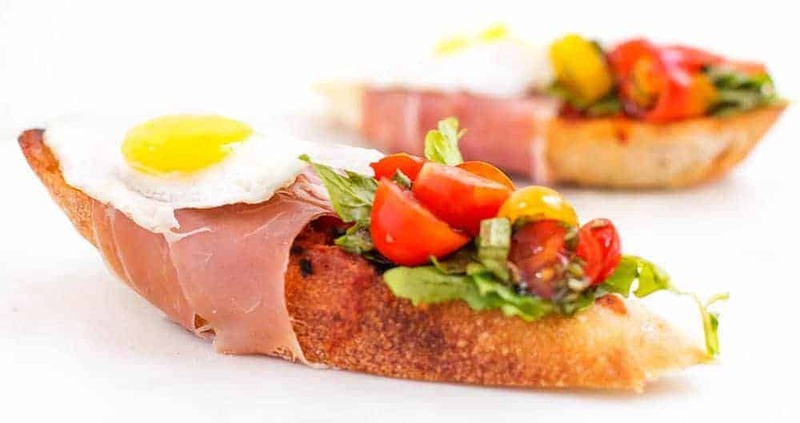 i could eat bruchetta all day long! this looks delish! Oh wow this looks sooo yummy! my son just made traditional bruschetta for everyone. I bet he would love this one. Wow, this looks like such an unbelievable appetizer idea. We are huge fans of Prego in our family and I am excited to experiment with it in a dish other than in pasta. Your photos make the dish look so unbelievably delish. Can’t wait to try it out for myself! This one looks fantastic, I’ve never tried it but I wanna make it. Yummy, I’m sure this is delicious and tasty. I’m going to make this at home. This looks amazing! I so want a slice right now! If someone made it for me I might try it. Your pictures look amazing. Where does one find quail eggs? 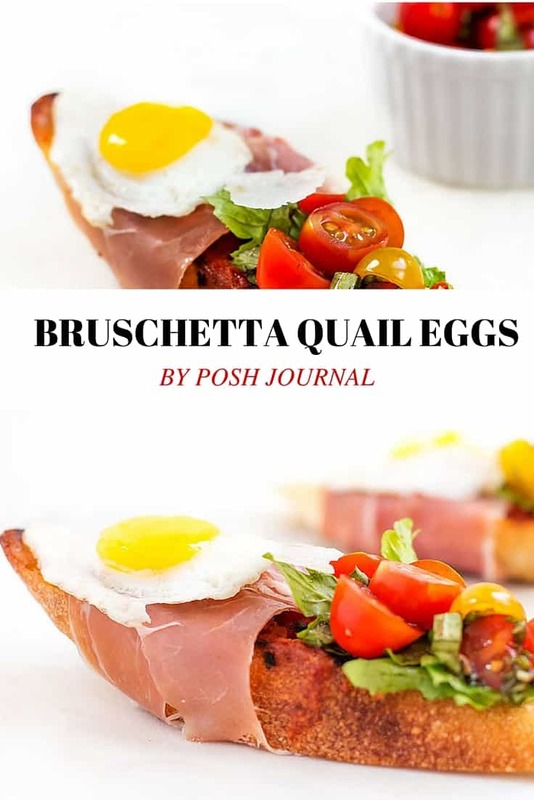 Bruschetta is one of my favorite things and this looks like a nice twist. I love trying new things and quail eggs would definitely be a new thing. We had too much sugary stuff in the house as well. I am kinda turned off by it right now and I never thought I wouldn’t want a piece of chocolate. lol. Okay, this looks absolutely amazing. I’ve never tried to cook quail eggs, and I’ll bet it’s difficult. And yeah, where would you buy them? This looks so delicious and easy to make. I will have to get the ingredients to make it tomorrow. I am sure it will be a hit. That looks so delicious! I can’t wait to try this. I love prosciutto! I’ve had quail eggs before but only boiled. I love every ingredient! What an amazing combination!